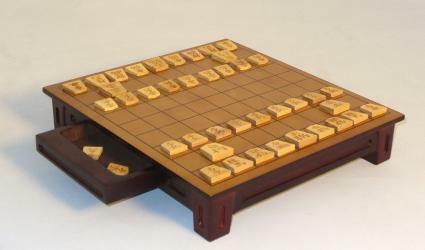 Shogi, also called Japanese chess, is a strategy game similar to Chess with the same goal of trapping the King. 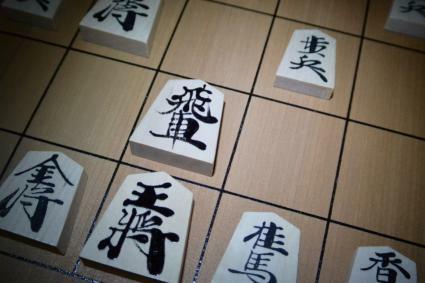 Three distinctive attributes of Shogi make it a significantly different game: unique arrangement of pieces, a larger board, and the ability to return captured pieces into play. These attributes create an intriguing approach to Chess which is probably why the game has remained popular since its 16th-century inception. The board is a nine-by-nine chessboard with rectangular playing spaces. Unlike chess, the pieces do not have a shape signifying their role. Instead the 20 pieces, usually made of wood, contain the Japanese character for the role in black ink on one side and red on the other. The red side designates a promoted piece. Some beginner games use icons instead of Japanese characters to simplify learning the roles. Since all the playing pieces are shaped identically the cone always faces the opponent to show who owns that piece. At the beginning, the pieces control three rows or ranks of the board. The first row places the King in the middle flanked by Generals. The pieces are lined up in this order: Lance, Knight, Silver General, Gold General, King, Gold General, Silver General, Knight, Lance. On the second row only two pieces exist -- the Bishop, which goes above the left Knight, and the Rook, placed directly above the other Knight. The third row contains the nine pawns. Deciding who goes first can be done with a coin toss. The player who goes first is black, the opponent is white. Although many of the pieces move in a similar manner to Chess, a few exceptions exist including using a piece to block an opponent instead of capturing them. Also, unlike Chess, in Shogi there is no Queen. Pawn - The Pawn moves one space forward and can only capture forward. It is the only piece that cannot retreat. Lance - The Lance can move any number of spaces forward. Knight - The Knight moves just like in Chess: one or two spaces in one direction and then one or two spaces perpendicular for a total of three spaces. However, in Shogi, the Knight must always take the most forward move. For example, if the Knight could move forward one and over two or forward two and over one, it is required to take the second move which pushes the Knight further into enemy territory. The Knight is the only piece that can jump over other pieces. Silver General - A Silver General can move one space diagonally or one space forward. Gold General - The Gold General can move one space in any direction except backward diagonally. Bishop - The Bishop moves the same as in Chess, which is any number of spaces diagonally. Rook - The Rook can move any number of spaces forward, backwards, left or right. King - The King can move one square in any direction. All pieces, except the King and the Gold General, can be promoted. Players designate the promoted piece by turning it over, showing the red-inked character. The Rook can now move one space diagonally. The Bishop can move once space to the left, right, forward and backward. The Silver General, Knight, Lance and Pawn have the movement of a Gold General. One large difference between Shogi and other chess games is that when you capture a piece, it becomes part of your arsenal. It can be placed back on the board (dropped) with the coned edge facing the opponent. When dropping a piece on the board, it cannot be placed on a spot that does not give the piece a valid subsequent move. A Pawn cannot be placed in the same column as another Pawn you already own unless the existing Pawn is promoted. When a Pawn is placed on the board it cannot produce an automatic checkmate. Check and checkmate follow the same rules as chess. If you attack the King with a piece and the King cannot move out of attack, checkmate is called. In Shogi a perpetual check is not permissible. Since Japanese Chess is not as popular in the United States as traditional chess, finding the game can be challenging in brick and mortar stores. A chess-centric shop should be able to order one if they do not stock the game. Amazon: The price range and quality vary significantly with inexpensive travel version for less than $10 to hand-carved, imported versions for nearly $300. 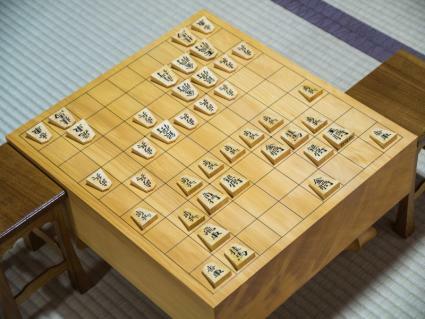 The Shogi Deluxe Board Game is a nice mid-priced option. The board itself is raised and features a drawer underneath for storing the tiles. It retails for just over $55. Yellow Mountain Imports: The store carries half a dozen varieties ranging from travel versions to wooden tabletop Shogi games. Prices range from less than $10 to around $40. Try this magnetic set to play on the go. It's great for car trips and camping, and retails for about $10. Chess USA: Located in New York, Chess USA ships nationwide. They offer five Shogi board options ranging in price from $10 to $30, including this colorful set that's perfect for beginners. It's inexpensive at under $10 and folds up for storage. Part of the appeal of Shogi to chess players is its complexity. This complexity is built into the game because of its unique approach to captured pieces. If you are new to Shogi, mastering the game can be challenging. For a deeper understanding of Shogi or to learn game-winning strategies, pick up the book Better Moves For Better Shogi, and make sure to play as often as you can to become more familiar with the game and its nuances.